About Moha : Moha beauty product for naturally pure skin and hair care. A wonderful mix of herbal extract and essential oil for natural skin care. The ingredients gently de-stresses and tones your skin, leaving behind a nourished radiance. 2) Moha Soap : It does not dry out the skin but do not expect heavy moisture from it. I like its herbal fragrance. If you're into body soaps, like I currently am, then get this one. It is inexpensive and costs just Rs. 68 for 100g soap bar. 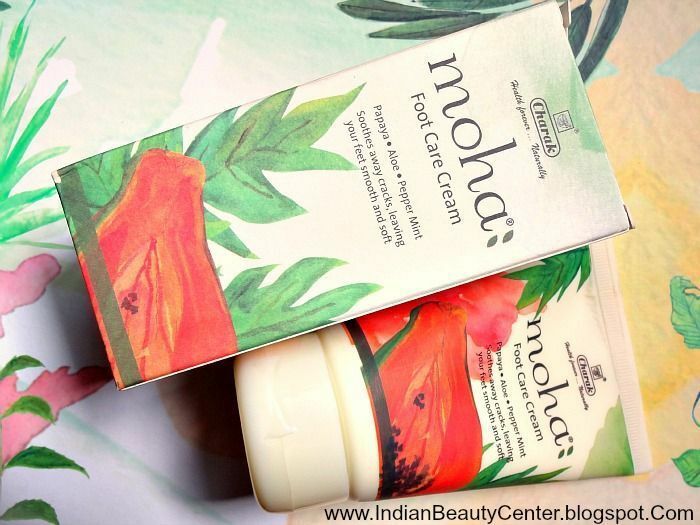 7) Moha Foot Care Cream : Winters tend to make my feet really dry and cracked. I use this foot care cream and then wear socks to lock in the moisture at night. I wake up with soft and healthy looking feet. Does not miraculously heal cracks fast, though. Priced at Rs . 163 for 100g, I definitely would use this cream for proper hydration and care of my feet. So these are the seven products that come in my Moha Hamper and you too can get it online priced at Rs. 905 679, currently. It comes in a gorgeous hard box. The antidandruff oil seems interesting. Winters is the time of excessive dandruff can give it a try. Haven't tried it yet but would love to since it is affordable. That was a very detailed review. Glad it lived up to the promise.